This plate girder bridge is on the London to Portsmouth line between Farncombe and Godalming stations, originally built as part of the London and South Western Railway. 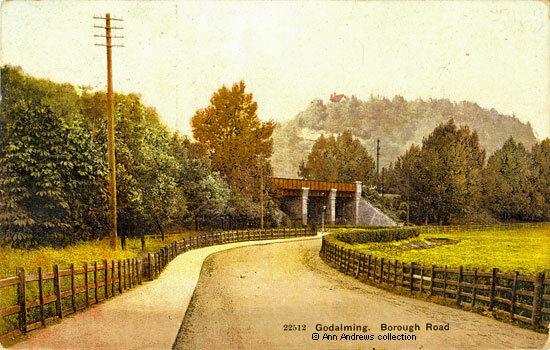 The line crosses Borough Road and then crosses the River Wey almost immediately on its route south towards Godalming Station (formerly known as Godalming New Station). The road bridge over the river is a few yards behind where the photographer would have stood. The backdrop to the scene is Frith Hill. The bridge was built in the mid 1850s when the line was extended southwards. In 1856, at the half yearly meeting of the Portsmouth Railway company, it was reported that "the works extend almost continuously from the junction with the South-Western Railway at Godalming to Haslemere", with the expectation that the Godalming to Witley section would be opened the following autumn. The immaculately cut hedge on the right of the road is a thing of the past. So is the greenery on the left; odd trees and shrubs remain on the railway embankment, but the land by the roadside is now covered with tarmac. "Godalming. Borough Road". Publisher Unknown, No 22512. Posted at Godalming in Sep 1907 and sent to Miss Freeman, Southsea.The message reads: "Will you tell Mrs B I called on Mrs Willard and she will return the cash to her. We spent a delightful day yesterday and left Stanley cheerful". Willard is still a local surname but the web mistress has no idea who Stanley was! "Hampshire Advertiser & Salisbury Guardian", Saturday, April 05, 1856.